Triangle Park is in the seaside city of Victoria, one of thirteen communities that form the Capital Regional District of British Columbia. Located in the area of Victoria called Vic West, come visit a cascading waterfall in the middle of the city at Triangle Park, which operates seasonally. 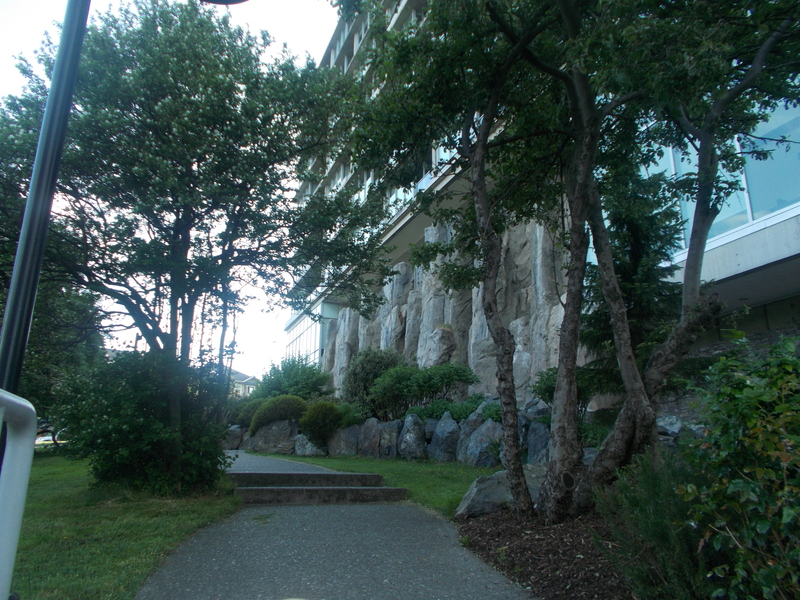 Created by the roadways of Bay Street, Tyee Road and Wilson Street, this park forms a vital natural area amongst the commercial and residential buildings. The water feature is down the wall of the building near the base of this park’s triangular shape. On a warm day this is a refreshing place to visit. There are about a hundred meters of walking trails throughout the quarter of a hectare parkland with shade from many trees. Flower shrubs and flowers beds highland the rocky outcrops in the grassy areas. Victoria West Park is across Wilson Street. Tyee Road Green Space is across the road. Triangle Park can be reached from the Trans Canada Highway. Continue along the highway as it becomes Douglas Street. Turn west onto Bay Street and continue across the bridge toward Victoria West. Turn left onto Tyee Road and then right onto Wilson Road. The park is on the corner where there is limited roadside parking. A city bus travels along Esquimalt Road from downtown.